A precious manuscript teaches us not only by its words and images but by its very life as an historical object. A prime example is the Crusader Bible, which is briefly being displayed with its leaves untypically separated before being rebound at its home in New York City’s Morgan Library. (The exhibition will live beyond its close on Jan. 4, 2015 on the library’s website.) The Crusader Bible’s tale recalls that of the remarkable Sarajevo Haggadah (retold as the novel People of the Book by Geraldine Brooks), which survived because it was passed among Jewish, Christian and Muslim hands over 600 years. The Crusader Bible, which is not a complete Bible and doesn’t directly depict the Crusades at all, started as a manuscript of 48 leaves (the Morgan has 43) of non-captioned Gothic illuminations created by professional but unnamed scribes in a Paris workshop in the 13th century, likely for Louis IX. Over time, passing perhaps through the hands of St. Louis’ younger brother and heir Charles of Anjou, the Bible may have settled in his Angevin kingdom in Naples and at some point picked up Latin inscriptions, although 14 scenes were misidentified. The manuscript’s life is documented definitively for the first time when it appears in the hands of Cardinal Bernard Maciejowski, the bishop of Krakow. He, in turn, inscribed it to a Persian shah who eventually received this Bible in Isfahan (modern Iran) in 1608 as a good-faith gift from the pope seeking to enlist him in a mutual fight against the Turks. This shah, ‘Abbas the Great, ordered Persian inscriptions and his seal added. After Afghans overran Isfahan’s library in 1722, the Bible passed into the hands of a learned Jew, who added Judeo-Persian captions and corrected Latin and Persian mistakes. From there, the manuscript entered the flourishing if murky trade in antiquities during the age of imperialism, ending up in Cairo and then London. At this point, the most interesting person in the life of the Morgan Library, the enigmatic librarian Bella da Costa Greene, enters the scene. Wondering about her future after J. Pierpont Morgan’s death in 1913 and without permission from his heir John Jr., she bought the Crusader Bible a few years later. Morgan fils was delighted, as it turned out, since it helped to establish him as a collector in his own right. The manuscript is literally (thanks to gold leaf) a shining example of the chivalric age of troubadours and their chansons de geste, although King Arthur and the Holy Grail appear nowhere. Instead, the Crusader Bible allegorically tells stories from only half a dozen books of Hebrew Scripture (Genesis, Exodus, Joshua, Judges, Ruth, and 1 Samuel) that depict almost 350 episodes. About 40 percent document David’s tumultuous life. The text seems to have served two main interlocking purposes: to bolster contemporary French royal authority as sacred and to justify violence as sanctioned by God. First, since all the scenes are dressed not in Biblical but 13th-century European garb and weaponry, the point seems to be that royalty at the time and place of the manuscript’s creation were the heirs of divinely-sanctioned rulers, hence the disproportionate number of David scenes. A careful look reveals that the Old Testament kings anachronistically wear the French fleur-de-lis on their crowns and carry the symbol on their scepters. The fleur-de-lis even appears on the Ark of the Covenant in a folio depicting David enshrining it in Jerusalem. The manuscript’s likely sponsor, France’s Louis IX, had been an avid collector of relics and surely saw himself, as did other crusaders, as a soldier of Christ and an armed pilgrim. 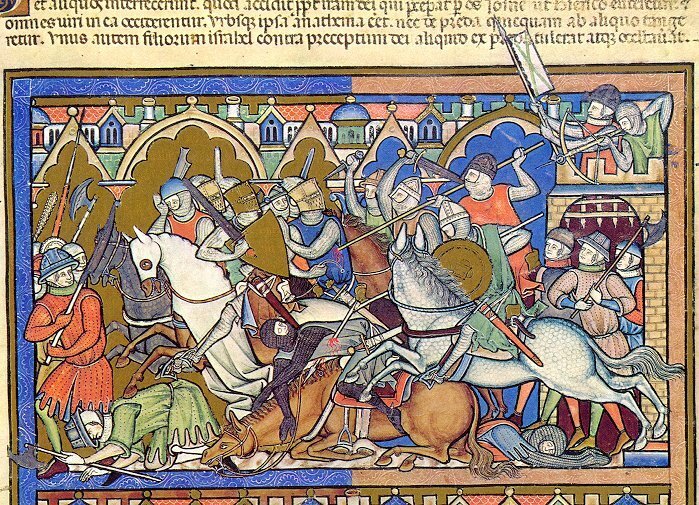 Finally, the Crusader Bible draws our eye through its dynamism and stark violence. Working from a common preconception of medieval manuscript figures as flat and stiff, viewers of either the manuscript on exhibit itself or in the bright colors of the website will encounter a striking movement in the action—a point easily explored through the website’s welcome “zoom” feature. The folio leaves’ frames cannot always contain the action. Goliath so towers over little David that his head touches the roof of the scene; David, needing as much leverage as he can get, steps out of his frame to plant his foot as he winds up his sling. Once slain, Goliath is still so big that his feet and scabbard stretch into the frames next to and below the main action while David’s sword saws through not only the giant’s neck but the folio’s margin. The exhibition’s signature folio demonstrates the precision of the manuscript’s attention to military detail—so precise, in fact, that the Crusader Bible has been used to identify period armor and tactics. In this leaf, Saul’s army is besieging the Ammonites before a castle. Saul himself crashes his sword through Nahash’s helmet while a soldier hangs onto a catapult’s arm—neither can be contained by the illumination’s border—to draw it back before sending a projectile to a tower. Adding to the sense of the fight, the exhibition borrowed from the Metropolitan Museum of Art a limestone ball weighing about 150 pounds that sits a few steps away in addition to a chain mail shirt, a pricked spur, a sword and a brimmed helmet (complete with wound hole) that are depicted in the manuscript. In the end, the exhibit displays a disturbing beauty of form, color and craftsmanship even as it represents tales of religious violence that, ironically, have been preserved and enhanced in a manuscript that has been touched by all three of Abraham’s children. Christopher M. Bellitto is associate professor of history at Kean University in Union, N.J. His books include the companion volumes Renewing Christianity and The General Councils as well as 101 Questions and Answers on Popes and the Papacy (all from Paulist Press).